Roman art refers to the visual arts produced in Ancient Rome, and in the territories of the Roman empire. Major forms of Roman art are architecture, painting, sculpture and mosaic work. Metal-work, coin-die and gem engraving, ivory carvings, figurine glass, pottery, and book illustrations are considered to be 'minor' forms of Roman artwork. Our knowledge of Ancient Roman painting relies in large part on the preservation of artifacts from Pompeii and Herculaneum, and particularly the Pompeian mural painting, which was preserved after the eruption of Vesuvius in 79 AD. Nothing remains of the Greek paintings imported to Rome during the 4th and 5th centuries, or of the painting on wood done in Italy during that period. In sum, the range of samples is confined to only about 200 years out of the about 900 years of Roman history, and of provincial and decorative painting. Most of this wall painting was done using the secco (“dry”) method, but some fresco paintings also existed in Roman times. There is evidence from mosaics and a few inscriptions that some Roman paintings were adaptations or copies of earlier Greek works. However, adding to the confusion is the fact that inscriptions may be recording the names of immigrant Greek artists from Roman times, not from Ancient Greek originals that were copied. Another source of Roman painting are the painted rooms of the Domus Aurea. Roman mural painting is generally distinguished by four periods, as originally described by the German archaeologist August Mau and dealt with in more detail at Pompeian Styles. 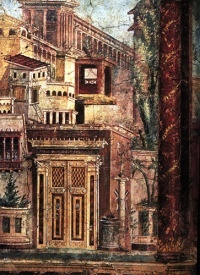 The main innovation of Roman painting compared to Greek art was the development of landscapes, in particular incorporating techniques of perspective, though true mathematical perspective developed 1,515 years later. Surface textures, shading, and coloration are well applied but scale and spatial depth was still not rendered accurately. Some landscapes were pure scenes of nature, particularly gardens with flowers and trees, while others were architectural vistas depicting urban buildings. Other landscapes show episodes from mythology, the most famous demonstrating scenes from the Odyssey. In Greece and Rome, wall painting was not considered as high art. The most prestigious form of art besides sculpture was panel painting, i.e. tempera or encaustic painting on wooden panels. Unfortunately, since wood is a perishable material, only a very few examples of such paintings have survived, namely the Severan Tondo from circa 200 AD, a very routine official portrait from some provincial government office, and the well-known Fayum mummy portraits, all from Roman Egypt, and almost certainly not of the highest contemporary quality. The portraits were attached to burial mummies at the face, from which almost all have now been detached. They usually depict a single person, showing the head, or head and upper chest, viewed frontally. The background is always monochrome, sometimes with decorative elements. In terms of artistic tradition, the images clearly derive more from Greco-Roman traditions than Egyptian ones. They are remarkably realistic, though variable in artistic quality, and may indicate the similar art which was widespread elsewhere but did not survive. A few portraits painted on glass and medals from the later empire have survived, as have coin portraits, some of which are considered very realistic as well. Unless indicated otherwise, the text in this article is either based on Wikipedia article "Roman art" or another language Wikipedia page thereof used under the terms of the GNU Free Documentation License; or on original research by Jahsonic and friends. See Art and Popular Culture's copyright notice. This page was last modified 18:32, 6 April 2017.